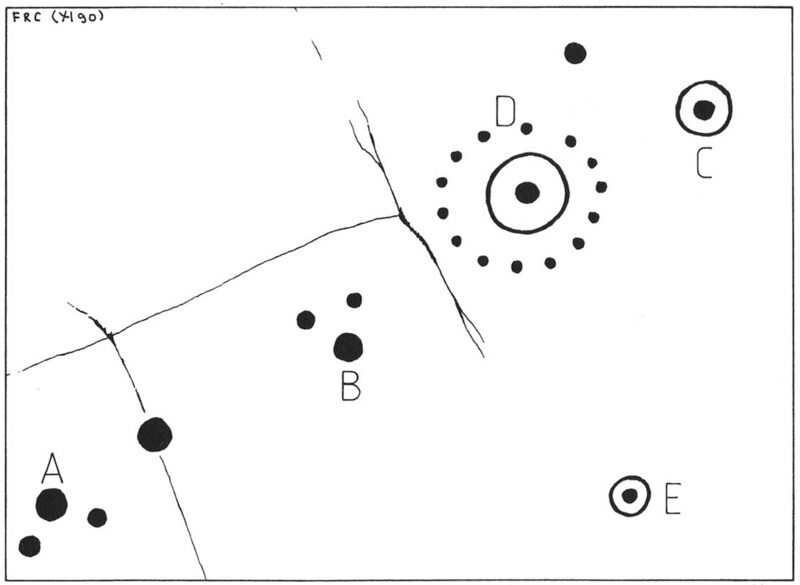 The drawing here is another by the legendary Fred Coles, previously unpublished until Maarten van Hoek (1990) brought it out of the dusty archives of the Stewartry Museum, Kirkcudbright, and described it in his article on prehistoric rosette motifs. As with its fellow carving of High Banks 2, the location of the site remains unknown; and van Hoek wondered whether these two lost carvings “could have been located at the spot where now the little quarry at High Banks site is found.” Let’s hope not! This entry was posted in Cup-and-Ring Stones, Kirkcudbrightshire, Scotland and tagged animism, antiquarian, antiquities, Archaeology, Bronze Age, carved stones, Cup-and-Ring Stones, cup-and-rings, cup-markings, Dumfries, Dundrennan, earth mysteries, Galloway, heritage, Kirkcudbright, Kirkcudbrightshire, neolithic, petroglyphs, prehistoric rock art, Scotland, Stewartry. Bookmark the permalink.